Two months ago, ESPN’s 30 For 30 offered a counter-narrative to its own “Survive And Advance” with the episode “Phi Slama Jama.” Now the series flips the script on its popular “The U” and “The U Part 2” with “Catholics Vs. Convicts,” the story of Notre Dame’s 1988 upset football victory over the University Of Miami. The two-hour documentary initially casts the Hurricanes as the big bad: the mean-spirited, unserious libertines representing everything antithetical to the storied tradition of the Fighting Irish. But the episode’s unique wrinkle is that it uses one controversial novelty item as a lens through which to consider whether a venerable institution has to become everything it purports to hate in order to succeed in the modern era. “Catholics Vs. Convicts” was directed by Patrick Creadon, an accomplished documentary filmmaker responsible for Wordplay, I.O.U.S.A., and If You Build It. He’s also a Notre Dame alum who was a student at the time of the ’88 game, and a close friend to classmates heavily involved in the university’s lucrative bootleg T-shirt market. So he knew the folks behind the infamous “Catholics Vs. Convicts” shirt that was sold illegally in the weeks leading up to the game, and which officially framed one of the decade’s best college football rivalries as a battle between good and evil. 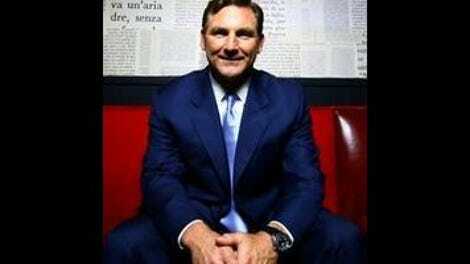 To Creadon’s credit, he doesn’t shy away from what’s problematic about the whole “Catholics Vs. Convicts” concept, from the direct accusation of thuggery directed toward a more racially diverse academic institution, to an assumption of saintliness that the popularity of the shirt itself (and the behavior of some Fighting Irish players) seemed to belie. At the same time, Creadon begins the documentary—pre-credits, in fact—with a reminder of how Miami embarrassed Notre Dame by running up the score in Coach Gerry Faust’s final game in 1985, suggesting that maybe Miami deserved whatever insults were flung their way. 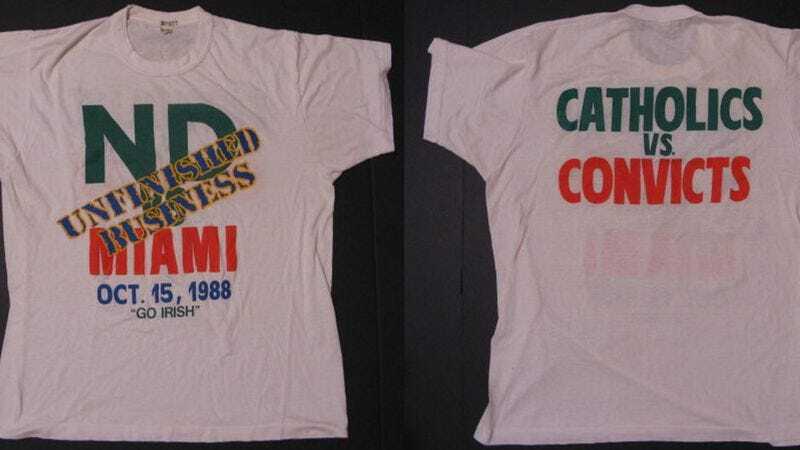 As for actual Miami players like Steve Walsh, Leon Searcy, and Cleveland Gary, some were offended by the shirt, and some thought it was funny… while pretty much every former Notre Dame coach or player interviewed here is either embarrassed by it or declines to comment. For the most part, this episode follows three main storylines, the most original of which is the tale of the T-shirt. Creadon looks back at the days when colleges didn’t fully realize the value of the logos that they slapped onto racks full of boring apparel at the campus bookstore, and how that left an opening for young entrepreneurs to manufacture their own shirts and sell them dorm-to-dorm. The “Catholics Vs. Convicts” shirt, printed up weeks before the big game, proved so popular that its slogan became headline news in the sports pages—which eventually got Creadon’s industrious chums into trouble. The bulk of the documentary deals with the game itself, and it’s here where Creadon does some of his best work, pushing “Catholics Vs. Convicts” into the ranks of all the great 30 For 30s that have broken down the tactics and emotions of a single athletic event. Creadon’s subjects cover everything from the significance of a pre-game shoving match between the two teams to how the Irish found a new level of confidence when the Hurricanes tried and botched a fake punt. The episode features a good slate of interviewees—including both legendary coaches, Miami’s Jimmy Johnson and Notre Dame’s Lou Holtz—and is anchored by a deep understanding of who the major players were, what they’d done up in college up to that point, and exactly why a mid-October match-up between two unbeaten, non-conference teams could be hyped as the game of the century. Creadon falls a little short in his compare-and-contrast between the Notre Dame and Miami programs. The latter has been well-covered by 30 For 30, granted, but there are casual mentions early in this doc about how Holtz sought to change the athletic culture in South Bend—even if that meant recruiting players who didn’t meet the university’s usual high academic standards. And there’s not a lot of follow-up on how the perception and the reality of Notre Dame football changed in the ‘80s. The best tidbit related to that involves quarterback Tony Rice, who had difficulty with his standardized tests and spent his freshman year focusing on his studies and befriending his classmates—including Creadon. It’s that personal connection that ultimately distinguishes “Catholics Vs. Convicts.” It’s all well and good that Creadon talks to broadcasting legend Brent Musburger (who called the game), or famed Miami journalist Dan Le Batard (who was a student at The U at the time). But it matters more how he narrates the episode himself, often slipping into first person. He offers firsthand perspective on how Holtz’s Notre Dame revival came to represent the “old-fashioned Americana” vibe of the Reagan era. And it’s clear that he’s spent a lot of thinking about this game, from the “phantom fumble” that cost Miami a touchdown, to a non-catch that refs decided was good enough for six points. The larger meaning of what happened in South Bend on October 15, 1988—in terms of the reputations of the respective programs, and what it meant to the people on the field—isn’t covered all that persuasively. But Creadon does tell the basic Xs and Os story very well, with a Greek chorus of himself and his old college buddies to explain how the outcome of a single football game could be so emotionally satisfying… like the long-awaited conclusion of a tumultuous heroic melodrama.